I hope all you 'guys' are doing fine. I haven't so much been taking any kind of a 'sabbatical' from the blog. Simply, my efforts and services are often required elsewhere. I'm getting along alright, thank you. Yet, between willpower, actual plans, and real time devotion to the blog have seen a small tug of war when it comes to the 'nitty gritty' of creating fresh quality articles in a timely manner. Don't worry, "Fayette/Westmoreland Forgotten History" as a blog, still exists. Thanks for your continuing patronage! Now, as a small foreword, it might be best if this blog is not overly long, because I would not want to bog people down too much with a lot of details on this subject too many more times. Keeping that perspective in mind might add to the interest of this type of material, yet this does border on a unique episode of military history, folks so it is well padded with historical data regardless. The truth is, this idea was planned as another addition to the Relatives and Ancestors series. On second thought, the decision was made for the material to go beyond basic family genealogy with a deeper meaning of a revealing historical context than just about my relatives. While poking around the internet a while back, I came across some fascinating information on a Presiding Officer for Colonel Ellsworth Post of the Civil War. "The Proceedings of the Annual Encampment of The Grand Army of the Republic" in various numbered volumes was a major source of information. Now, you can probably imagine that I hardly expected to locate something personal of such a caliber in this manner. Only a sense of curiosity and a touch of presentiment caused me to search it out. Just an idea, really. I became thoroughly delighted to of made such a surprise discovery, however piecemeal it was at first glance. Ephraim Elmer Ellsworth was a popular figure. He was a colonel of the Chicago National Guard Cadets and worked with the New York City firemen. He studied law under Lincoln in Springfield, Illinois, and helped organize his 1860 presidential bid. The colonel also became a competent officer, and close friend of Abraham Lincoln. The story goes that while looking out the window at the White house near the beginning of the Civil War between the American states, the President sternly noted to Ellsworth the 'Stars and Bars' flag freely flying across the Potomac River. 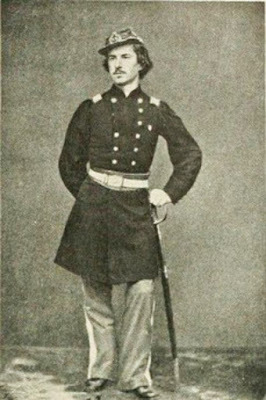 On the morning of May 24, 1861, under the direction of General Scott, after disembarking from one of the steamers, Ellsworth, the founder of the 11th New York Infantry Regiment, with little resistance from a retreating force, headed up into the Marshall House hotel in Alexandria, in the Commonwealth of old Virginia, which became an independent city. With a few of his men, he proceeded boldly upstairs, grabbing the offending Confederate flag from the roof top and began rolling it up. On returning downstairs he was suddenly confronted by the secessionist landlord, James Jackson, who claimed he was 'a boarder.' Jackson quickly let the colonel have it with the roar of a shotgun in the chest. Abruptly, on this encounter, Jackson was immediately shot dead. As can be imagined, Abraham Lincoln was saddened and almost inconsolable. 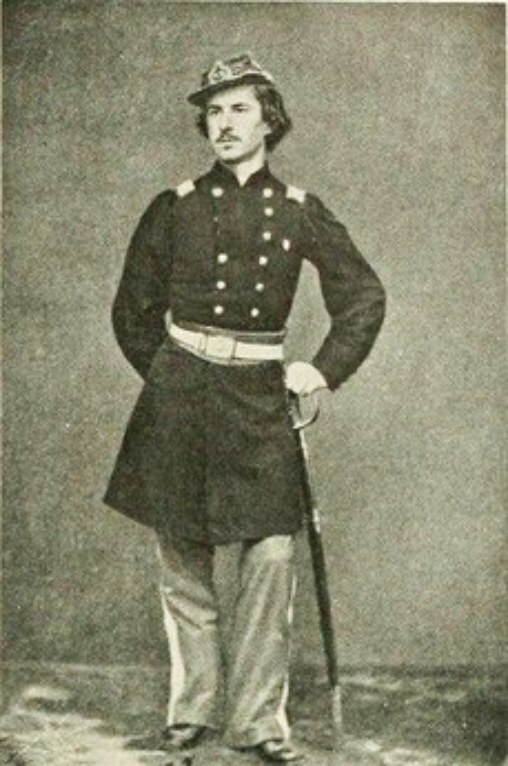 Colonel Ellsworth had the distinction of being the first casualty of the Civil War. Lincoln had the favorite officer laid out properly in the East Room for the funeral. "Remember Ellsworth!" was soon a Union rallying cry! Various places, towns and military posts were named after him in his honor. 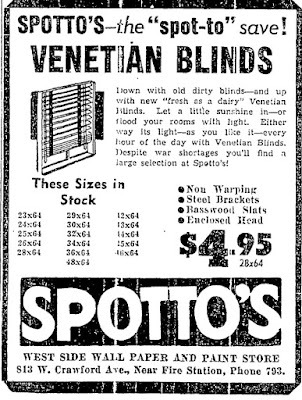 This was indeed the case with a special one in Scottdale, East Huntington township of Westmoreland County, Pennsylvania. A Sept. 7, 1887 article in the Daily Courier maybe allows the best gist of what the early encampments were like to actually experience. 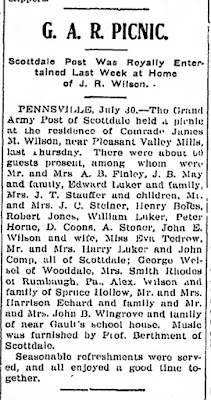 The writer relates that The Grand Army posts of Dunbar, Uniontown, Dawson, Stonerville (or Alverton), Springfield, Connellsville and Greensburg were their in full regalia; in all, 1,000 of these men showed up at the Scottdale post starting on Thursday evening, culminating where "Old Veterans Play Soldier." 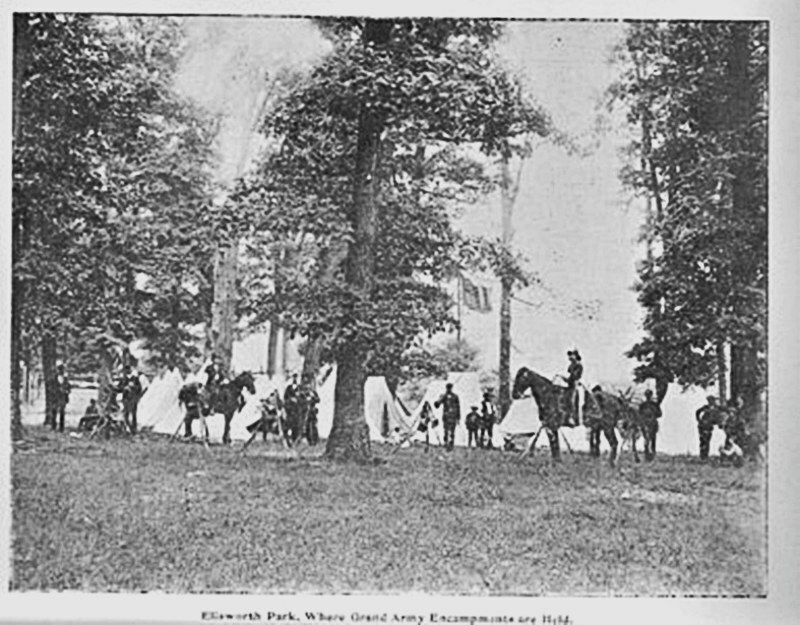 This was , of course, aat Camp Ellsworth, Post 209, or, as specifically termed, 'Ellsworth Park' in Brown's Grove, (later called, Browntown by the locals), just north of the main thoroughfares of Scottdale. The Scottdale historical Society may be interedted in this story. I haven't gotten around to informing them or learning of thier opinion on these matter so far. They would tend to kick things off with a parade from the 'handsomely decorated' town with 'a large and enthusiastic crowd' to the site that at one time was over 8 acres, where the Everson Drum Corp was in attendance playing 'old time martial music'. There was set up a little village of tents in the woodland and everything was arranged for field duty in as realistic a manner as possible. Next up, all were regaled by lots of song and speakers, They probably then built up the bonfires, though it doesn't come right out and say so. On Friday afternoon, a 'sham battle' was displayed for the 'entertainment' of everyone present. No one was hurt, but the powder burnt 'was fearful to contemplate'. 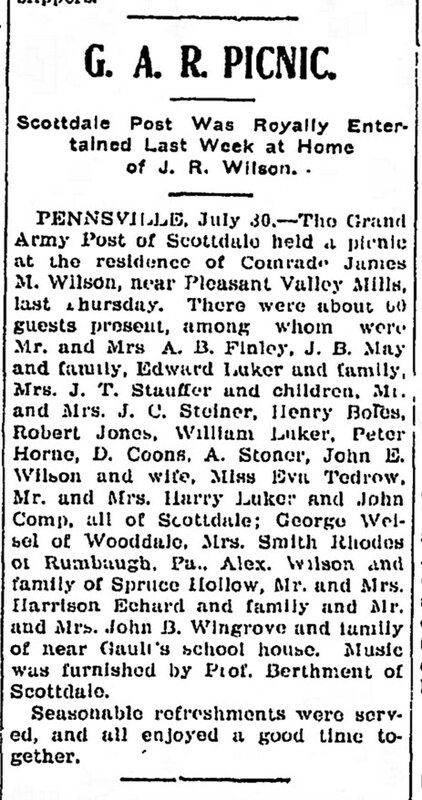 This was followed at the gathering by a rousing address from a United Presbyterian minister of Scottdale at precisely 8 p. m. By Saturday, there was estimated to be 10,000 visitors, many of them old vets arriving by train from Mount Pleasant, Latrobe and Irwin to witness the great spectacle and, one would suppose, take refreshments. At noon dinner was served, this must have been a lot of industrious work for the ladies involved in cooking and the clean up would surely of been something else - there were more speakers, colonels and generals and parades by various regimental companies. Then, another reenactment took place. Sunday saw more grand dress parades and religious services watched and admired by the many civilians crowding the camp grounds. Thus following, another sham battle between the infantry, cavalry and the artillery; not without a few wound that were only all too real. These events must certainly of been a wondrous sight, eh folks? Here, here. They finally broke camp late Tuesday night to end the festivities and their fellow citizens heartily enjoyed the whole endeavor and were thanked for their hospitality one would assume with civil decorum while the reception of the vets were highly appreciated as well. 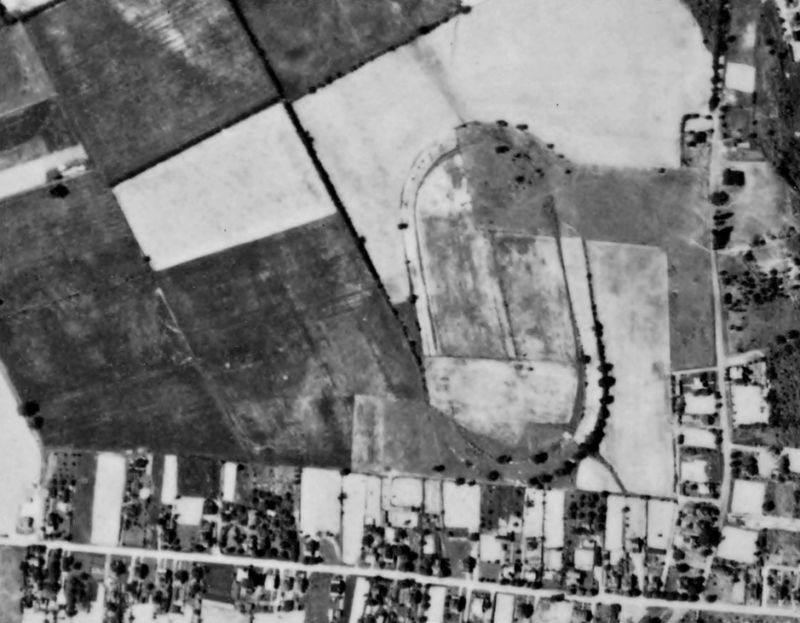 Overhead view of Ellsworth Park from the 1930's. Enter: My great, great grandfather. I already knew part of his unique story and sever wounding in the Civil War and his service at Gettysburg. Now there was more to learn and more to tell. The first of these Annual Encampments began in 1888. Of course, my main point remains with James Wilson's connection to the G A R, but no attempt is being made to necessarily ignore other aspects of the gatherings or those other worthy high officials involved except to not let the size of my post expand greatly beyond original intentions. I had more material taken from older research I am looking around for indicating the old veteran's overriding presence on years between 1905 and 1910. Still, as an actual example, James Martin Wilson of Wooddale, Fayette County, was indeed Ellsworth Post Commander in 1913 for Scottdale No. 209 and for the Sons of Veterans, according to The Daily Courier, Wednesday, May 21, of that year and in other years too. The exact manner in which my, g, great grandfather came to this high position, I know not. His personal story, of a serious wound through the throat that he wasn't at first aware of through the effects of shock, into which was run a handkerchief to keep out the maggots that would infect the wound, is true and one of the rare family traditions we have of him. This is certainly a grisly one which may of had a grip on others with the added gift of storytelling. Otherwise, not much else is sure at this late date. But, he must of had the presence, influence and some charm to be awarded such an honor in those times. This was a very serious event and an important experience to represent the 'Grand Army' the way he did. 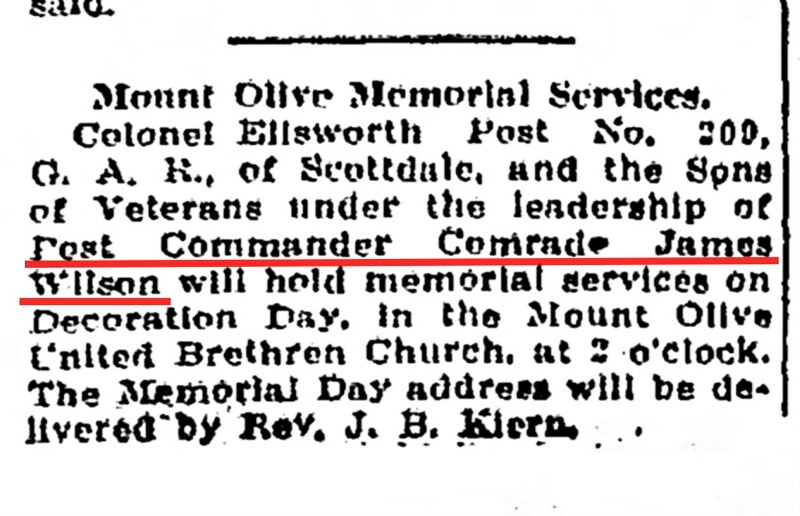 I am proud to note, he also headed up the Memorial Services for Decoration Day at the Mount Olive United Brethren Church of which he was an early member, as was his son, Shed and grandson, Meryl Wilson. He held the illustrious title of Post Commander for at least four years in the early years of the twentieth century as well: those years with documentation are 1912-1915. I believe I've ran across one or two other earlier years as well. It is unfortunate locating again a portion of the exact proof was one big reason this blog post was so long in seeing the light of day. I trust enough evidence is scattered around in here to reasonably allow for the case to be well made. 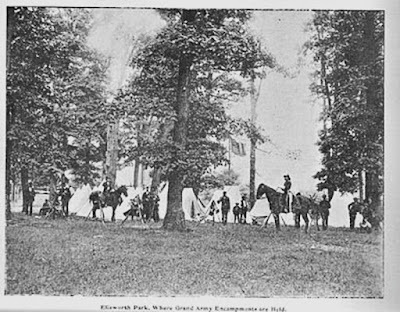 The duties of this particular leadership role were fairly impressive: keeping an eye on entertainment, helping with guests, coordinating events, while having superior charge of the whole encampment under their supervision and were engaged with most activities and personally involved the direction of the various concerns of the GAR eight-acre grove while making impressive, moving speeches. This was not something given out lightly to the military or to the public at large! At one time, and I'm not positive how often, the surrounding posts, such as Dunbar, Dawson, Springfield, and even Connellsville also sometimes also encamped here, at least for a weekend in certain years. The important festivities would begin at 7:30 p. m. on Thursday evening. These often took place in late August and early September, but not always. I haven't followed the earlier years in too much depth. In creating an article in honor of my great, great grandfather, James Martin Wilson, I personally know very little about him. It may be supposed the man has the appearance of a basically unassuming person of average proportions, yet there was more to him than that. Naturally, I am very proud to have access to what is available and of his particular commitment and serious dedication in the Civil War and beyond. The different reenactments in Westmoreland and Fayette counties here in southwestern PA must have been quite exciting events for the old timers and the observers as well. He saw action at the battlefields in numerous sites which include Gettysburg. 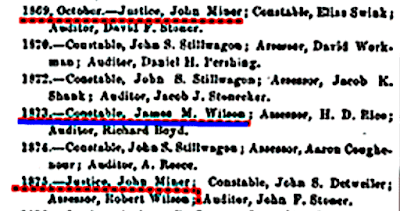 James had the distinction of being a one time Constable of Bullskin Township of Fayette County, Pa., in the year, 1873 which I will get back to in a moment or two. One more thing, clicking the 'relatives' or 'Wilson' links on the sidebar of the blog will provide further information for the subject if visitors will just scroll down. We do know that this ancestor use to hold family reunions at various place, at least one being at the Mount Vernon Park. He was married to Louise Grimm, (my g, great grandmother, of course), and rather conveniently, her family lived right across from him on the Shenandoah Road near the corner of Breakneck. The James Wilson farm was on the side where Woods' greenhouse recently was in business. I wish I could add an old photo of the old homestead, but if such exists, my side of the family have no knowledge of it. I heard there was once a photo of James Wilson in his Union uniform. We haven't had the proof to substantiate this tradition as of yet. From what info I could gather, and some of that is speculative to the extent it has not been completely confirmed, the situation of ancestry appears that James (2) was the son of James Wilson (1) and Elizabeth McBrady. Now, that James' parents were William and Catherine Wilson. He, himself, was born in 1819, in Hornellsville, Pa and got married and later died in Fayette County, in 1903. I recently discovered some likelihood these Wilson's were related to those of Dunbar. Continuing in this vein, it appears that the earlier James' immediate children, and therefore my g, great grandpap's siblings, would have been born in this order : Anna, Alexander, Martin, Joseph, Daniel, William, James, who lived in Connellsville, (which fits in with my g, g, grandfather), Charles, and Minnie, who died in infancy. 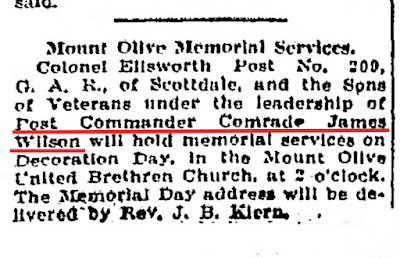 I just discovered an old note that proved James was also the Post Commander of Ellsworth Post for 1912. If I find time I will try to upload this and possibly others. However, hopefully, you all get the idea behind this part of his life. 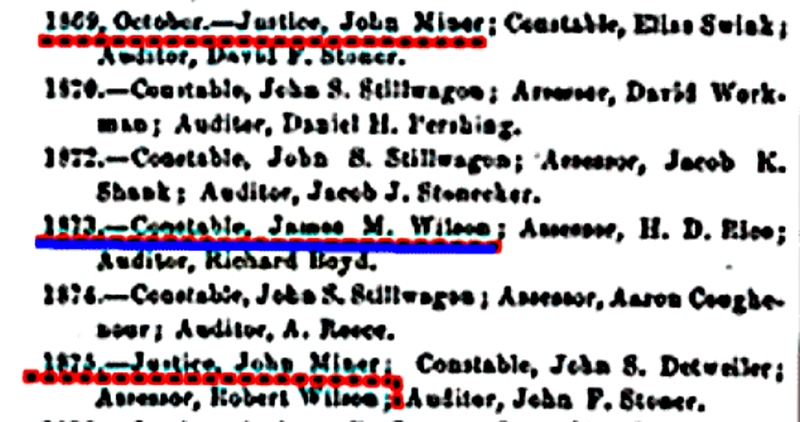 As can be noted by this page from an old history book, John Miner appears to of been the Justice of the Peace during James Wilson's constabulary watch. Justice Miner became an ancestor of future generations of the Wilson family by the occurrence of his daughter marrying George Hatfield. George was the grandfather of a lady whom James Wilson's son, Shed Wilson, had married, one Mary Miner Wilson. John Miner Jr, was one of the more prominent men of his community, but maybe more information should be related in a proper post. 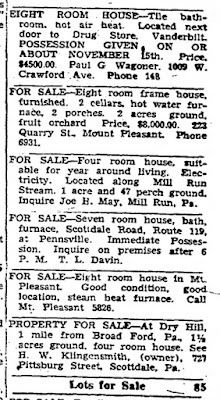 Although, I find that certain details have remained a bit sketchy, there really are many extra details involved, and some of these are not posted on previous Relatives and Ancestor posts of past 'Fayette/Westmoreland Forgotten History' articles for the simple reason that they were not known then. If the subject of the military posts interests you a lot, included in 'Snowy Stroll Through Scottdale', is some added material on Ellsworth Post. 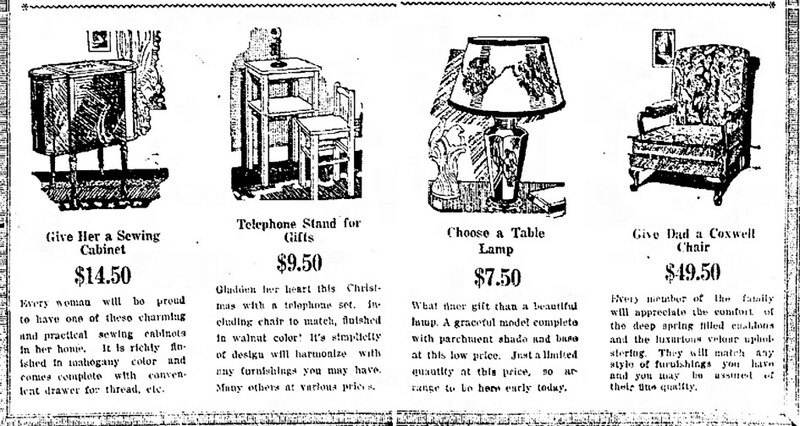 "I am content, confident that he who noteth even the fall of a sparrow, will have some purpose even in the fate of one like me"
This ad from Chinn's gives a fair idea of prices in the olden time. Folks, we all know plenty about the rising prices which has been going on for a long, long time. Whether it's gasoline or other fuel sources, the exorbitant expense of purchasing a new car, or commodities and general products we buy almost everyday, inflation actually only appears to continue to go sky high.There were eras when it was much worse! 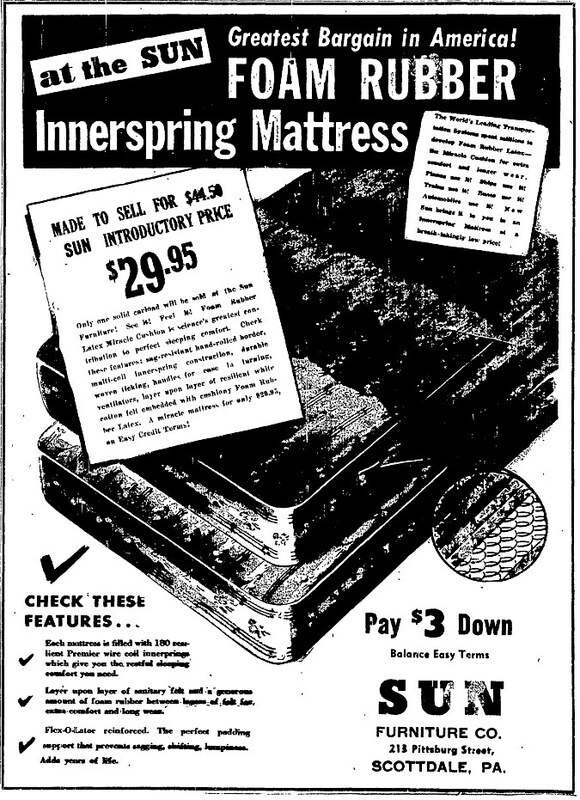 Many of us remember the retailers, like for instance, Montgomery Ward, while we still have a couple in existence in J. C. Penny and Sears, but things are very different and more's the pity as the manufacture of many products have long since left our shores and quality has tended to deteriorate over the years. So here is a handful of examples from way back in the day, so to speak. As far as the causes of inflation and its influences, this is an economic issue concerned with the increase (or decrease) in price levels of consumer goods while experiencing a reduction in purchasing value. This is caused by various factors. Regardless of the meaningful details (which can be difficult to understand), we are not using this space to go into all the technicalities here. 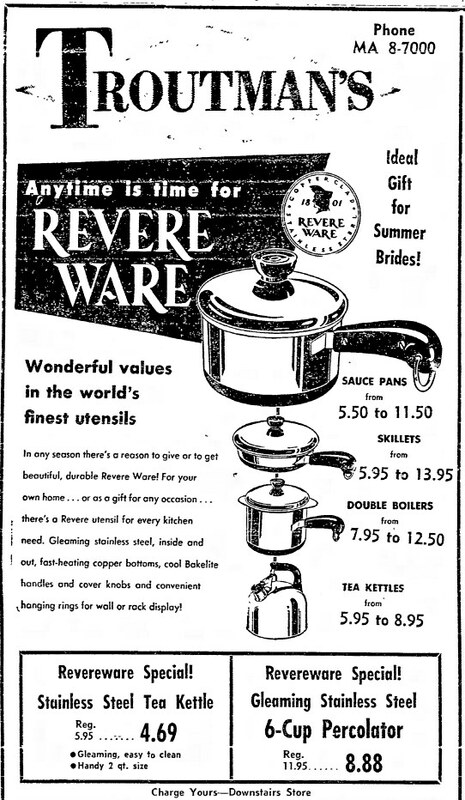 The main idea on our post is to have a bit of entertainment with some educational info included as we take a gander over our modern shoulders back at what items use to cost in the 'good old days'. Hey, let me know if you enjoy these! 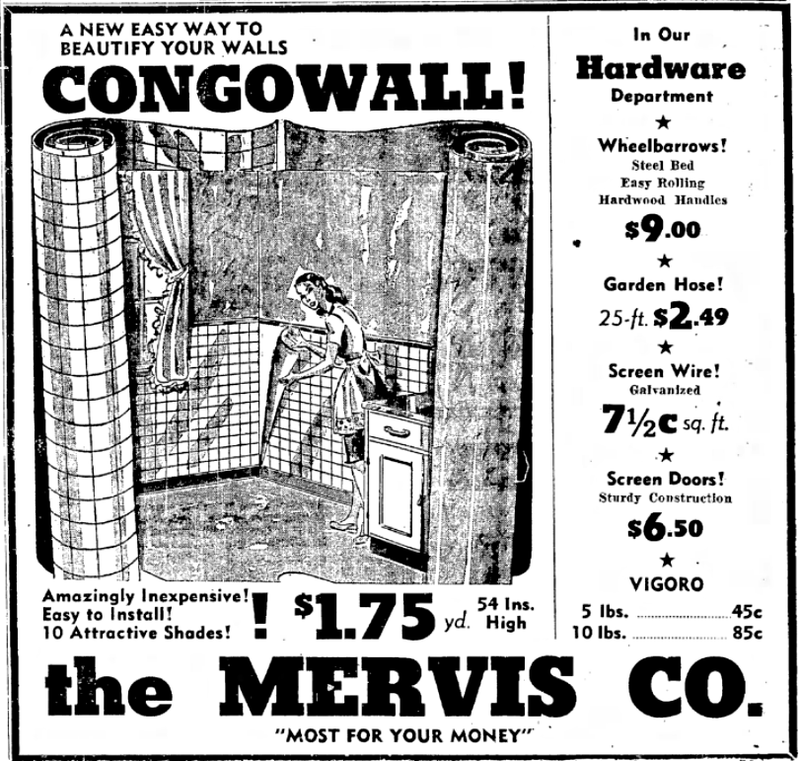 From the Mervis Company comes -the "CONGOWALL"! Now, I have collected a lot of these for many types of products. Perhaps, if you give me a hint, I will consider posting another batch in the future. Is that a deal? 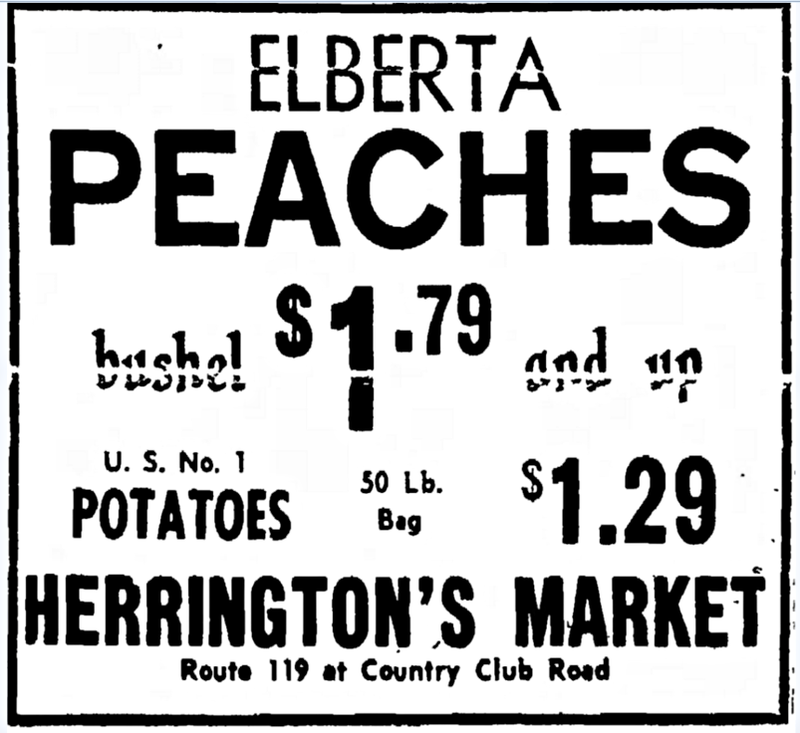 I missed the year for this one, but it was surely long ago when there use to be a market by this name on 'old 119' near Pennsville selling a bushel of peaches at these prices. 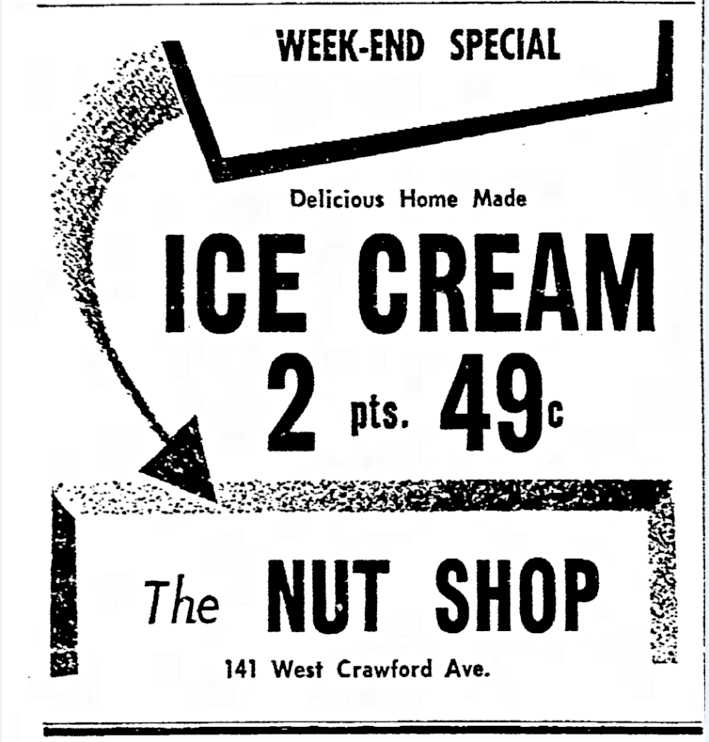 These was also a Nut Shop on the corner of Pittsburgh St. on the right at the second red light in Scottdale. 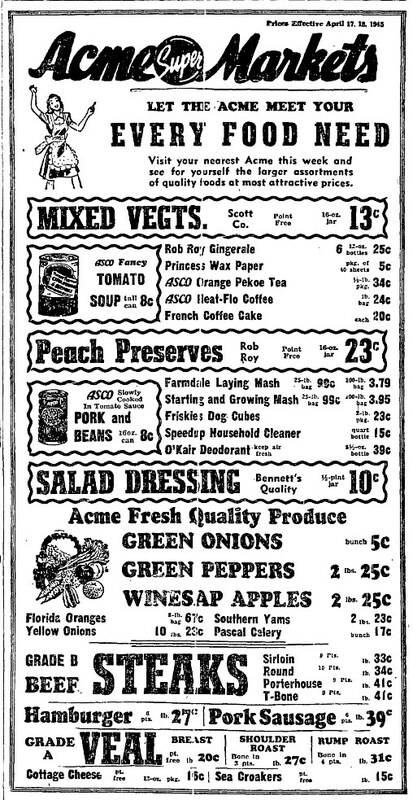 Above is a good smattering of prices for Acme Super Markets from the year, 1945. 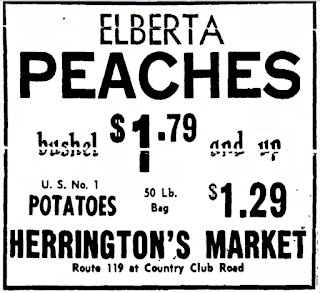 I don't know about the rest of you, but I suddenly feel like doing some serious grocery shopping. Lol. 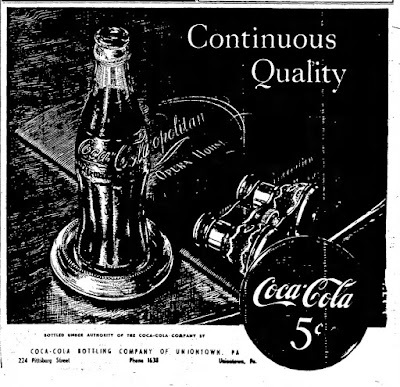 From the Connellsville Bottling Works provided the one below. Does anyone remember 'Spur'? 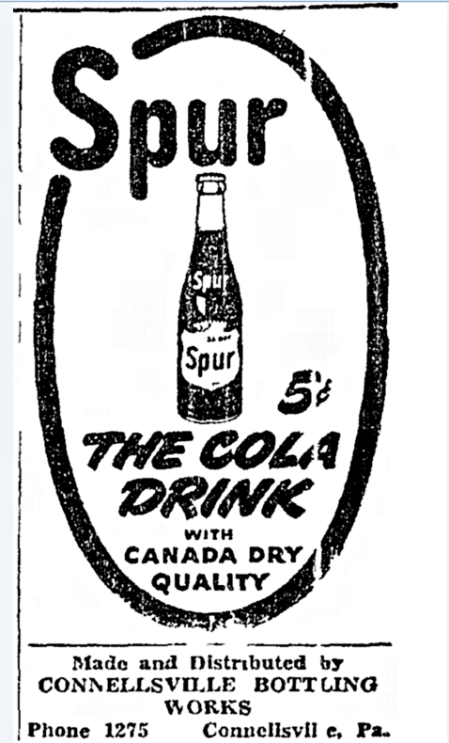 Apparently it was just about as good as Canada Dry. 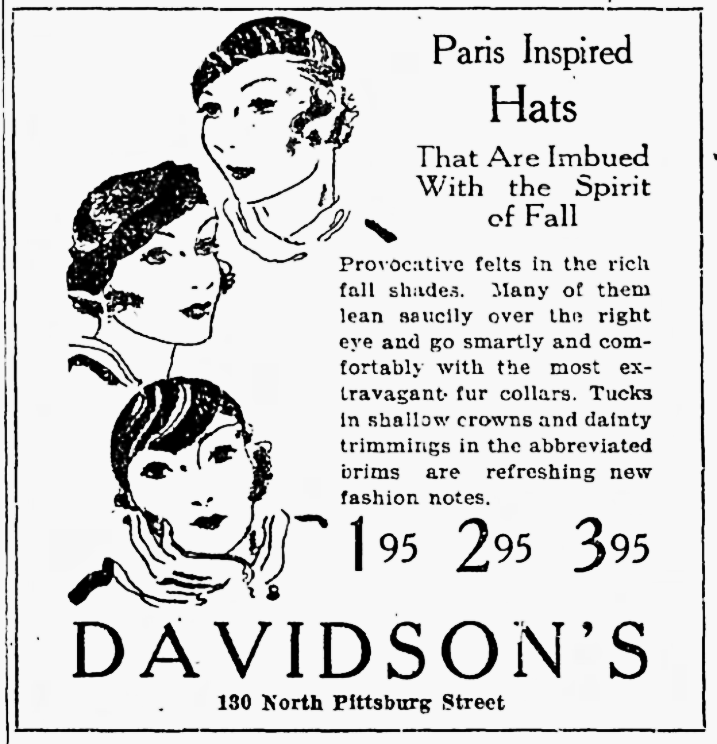 Those high priced fancy women's hats! When's the last time you heard of prices resembling that for a train trip out east to do a bit of gambling? 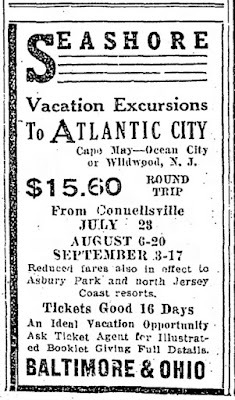 The ad is from July 10, 1931. Reasonable cost. AND, as most locals know, the store is still in existence. H'mmm, a couple of bucks for a shot gun -what times! 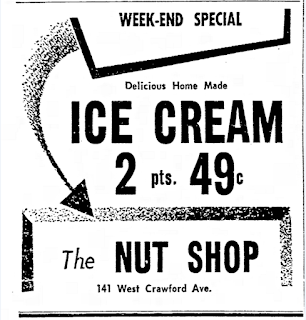 Next up is from the late 1950's. The brothers were still there in the 1970's, anyway. I have fond memories of my parents taking us to the experts at Simon's in Mount Pleasant from the 60's and 70's. 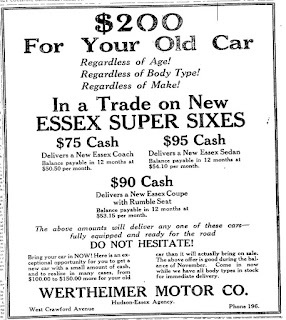 Nothing like an inexpensive car, eh? 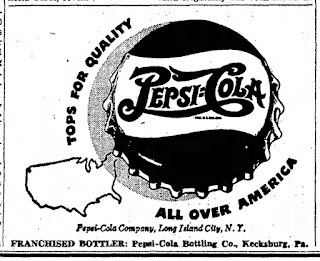 A company from the 1940's. A good, dependable store. 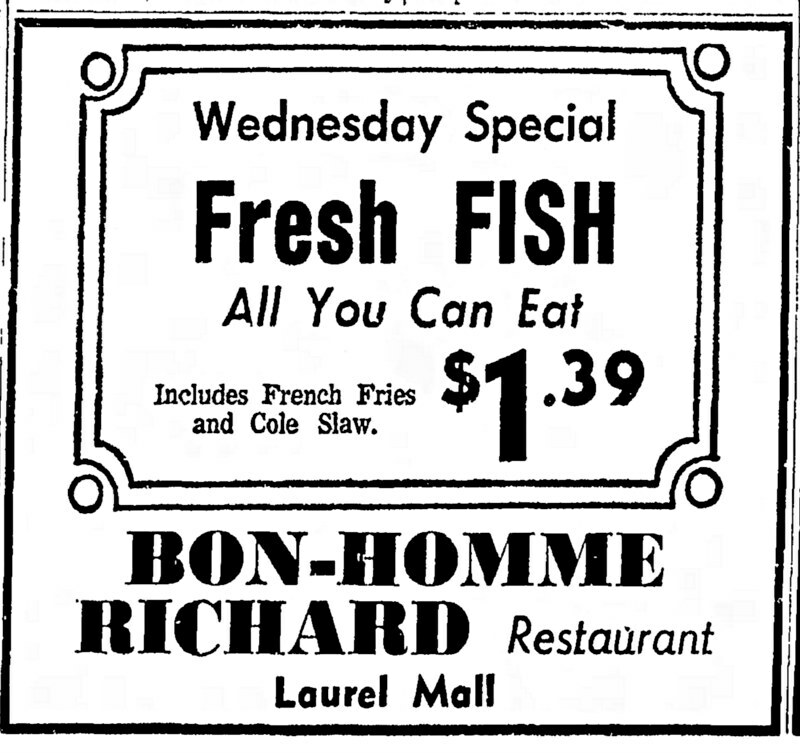 Ad is from 1959. Hagan was a popular, high quality local brand originating from this region. 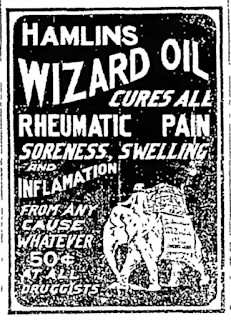 A personal ad placed in the Courier on June 4, 1931. 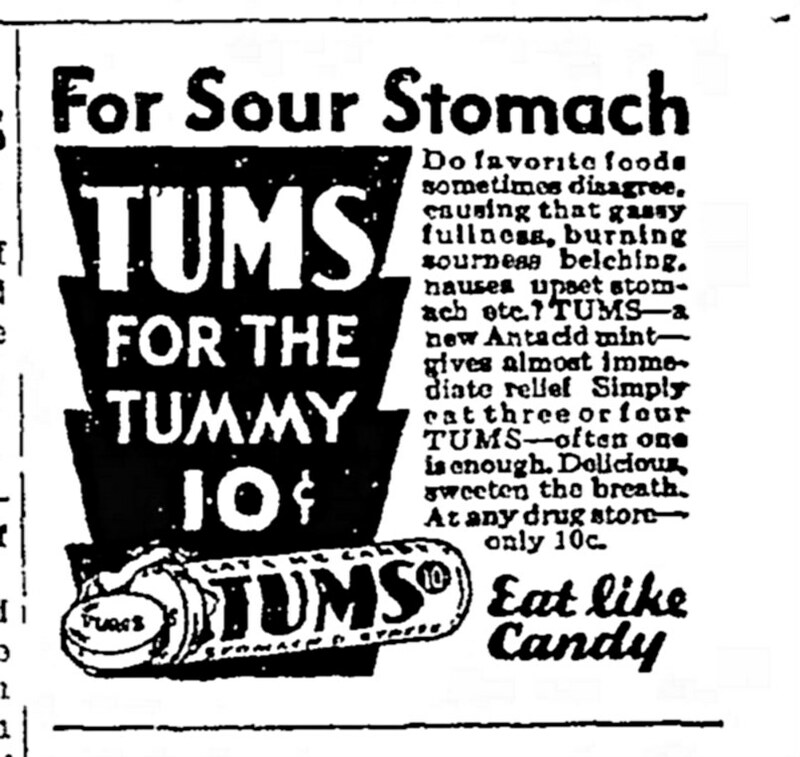 We all know of the Tums company, but back then people ate them "like candy"! This shoe ad is from 1936. Many of us remember this standby. Ad from 1971. The above ad brings back the days when my friends and I use to go have coffee and dessert down at the mall in the 1970's. 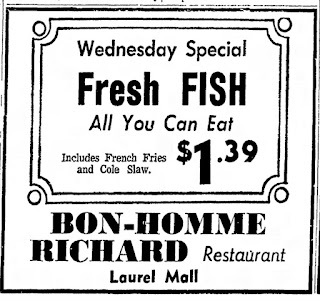 I don't think I tried the fish, but some good, simple times, folks. 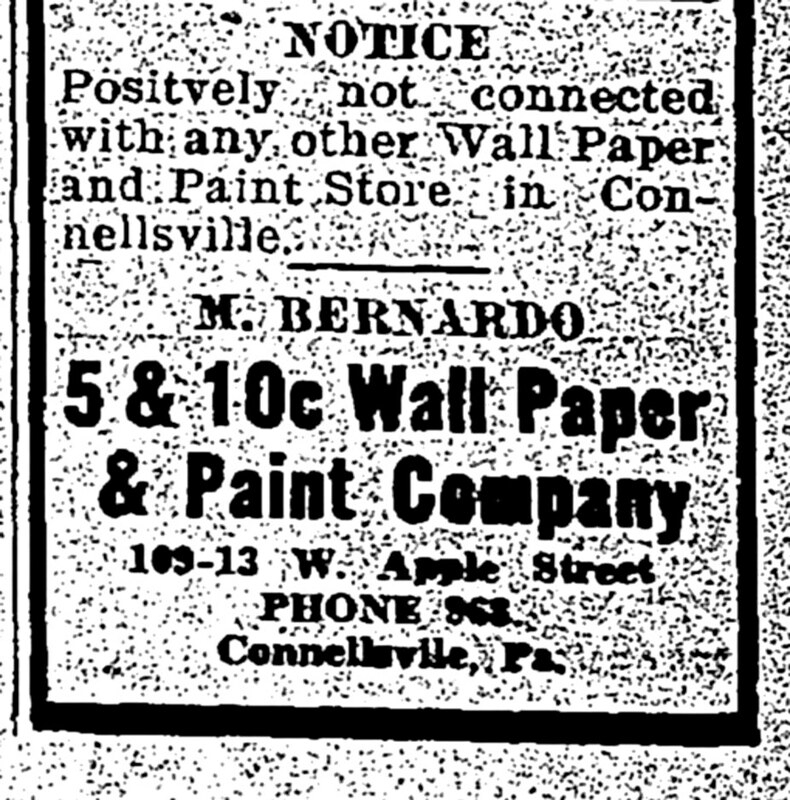 A 1939 advertisement for cheap wallpaper. 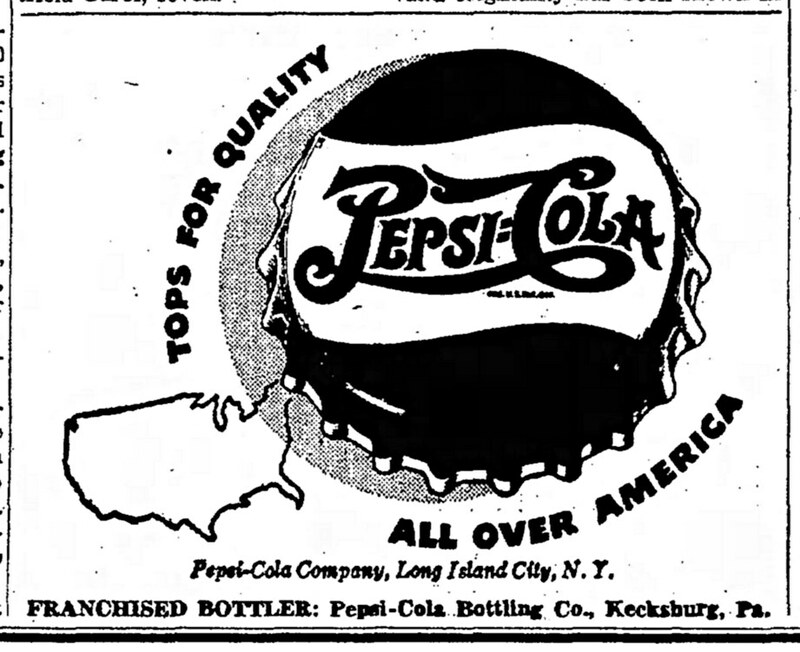 An old Pepsi ad from 1936. And to be fair, a Coca-Cola ad from the same year. 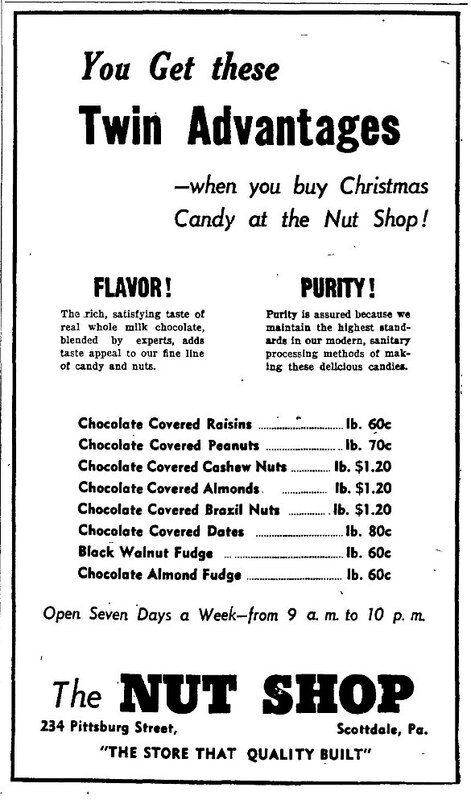 Another Nut Shop ad for Scottdale's version from 1946. Mmmm.. Imagine a chance to purchase some of this furniture?! 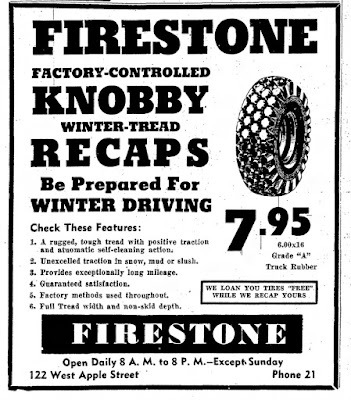 A special hats off to The Daily Courier, the newspaper which handled many of these ads along with a whole slew of other ones stretching back past the 1900's. 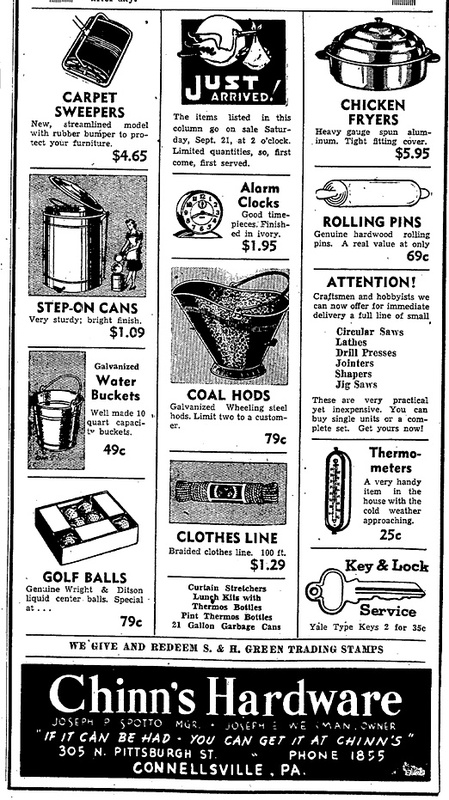 Please do let me know which tickled your fancy and any comments about other products that struck your memory when you were much younger are more than welcome. Yes, I'll be glad to read your responses and more of your personal memories and observations. 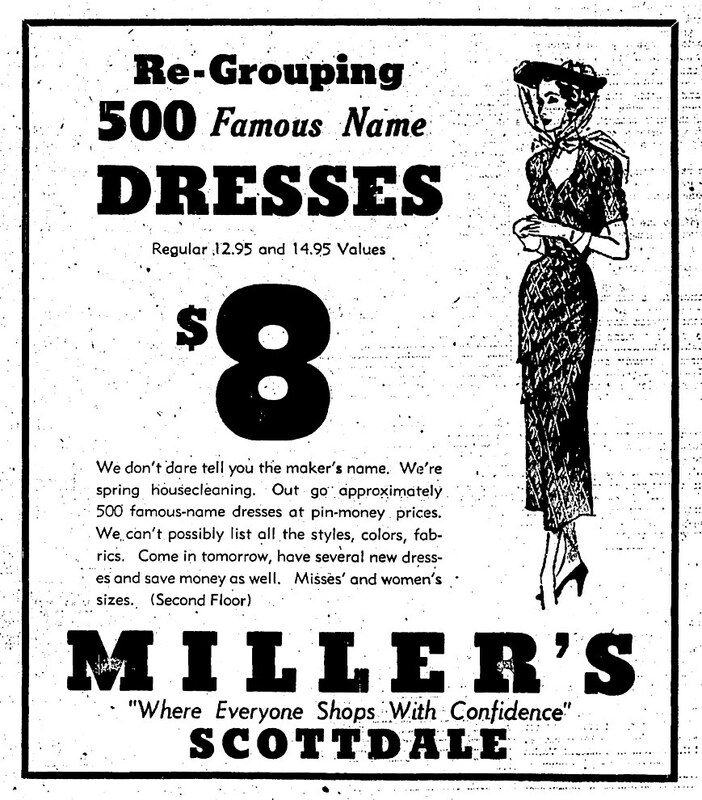 Those youthful blog followers that have no recollections about them or these stores can get an idea just how much your pocket change was once worth too! 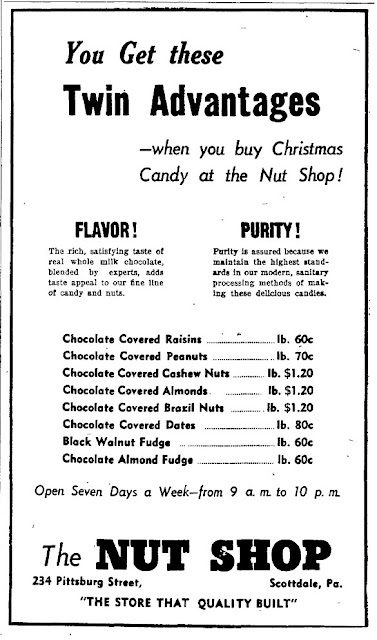 We begin by briefly referring to a hoary tradition. 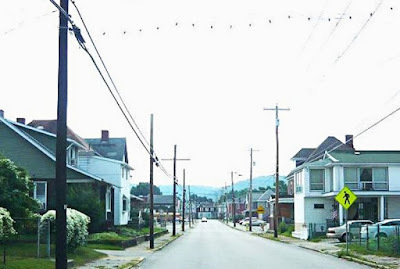 The old story has it that a German trapper had built his solitary cabin at what is now the end of the street car track line in South Connellsville, Pennsylvania, a very long ago. I also read that he was the pioneer that rather mysteriously, and suddenly, disappeared. Interesting aside. Yes, this is going back about as far as is possible. A part of this particular area was later called Gibsonville, while another of the old, quaint monikers was "White Rock." A description fairly named for the light color of the quarry stones nearby. There was once a schoolhouse with that name also. That brings us to a roundabout segue for the Casparis Mines, or somewhat more correctly - what became the well known quarry. Though there were earlier owners, the lower location came into its own with the third quarry of Ken Casparis, in the year, 1916. As far as I recall, for quite a few decades it might be looked on as trespassing to head down inside the 'caves' as when we were nearer to being teenagers and there were occasional parties with alcohol and the sweet smell of burning tires which there was a large stack of near one of the entrances. Those times are gone and so is the assumption that taking your chances with safety is something taken for granted. It is believed there is a route through that comes out on an air shaft of one of the caves to the surface nearly a mile away, but am not certain if this as true and have not noticed any documentation. The old lake that was at Soisson Park goes way back too to the 19th Century. In fact, it was located at Park and Dushane Avenues. 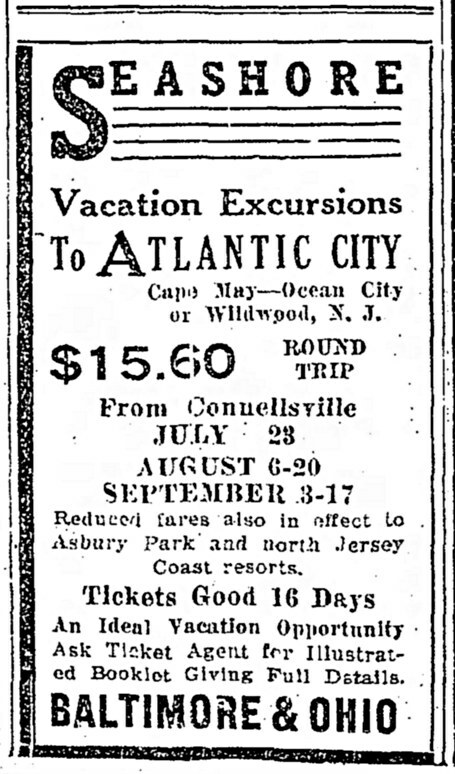 This was a very popular destination for recreation. There are so many great houses, banks, stores and impressive buildings with interesting architecture and furnishings it would, unfortunately, be beyond the scope of this article to catalog them all. This is referred to in more in depth on the main Connellsville post from some years ago. 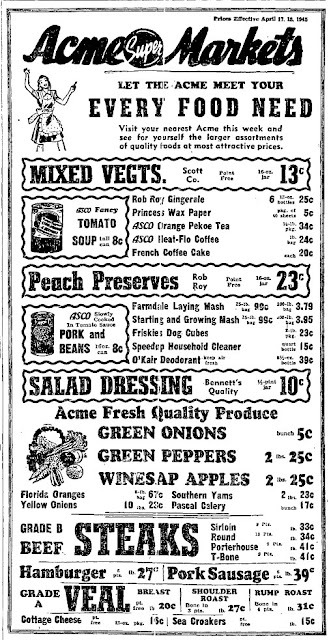 Also, here's a link to the Connellsville Canteen post. Next, we will highlight a few of the most prominent industries and facilities here and there. A place like this can be overshadowed by larger cities like Connellsville itself. There are less than 2,000 residents here nowadays that have hung in there through some rough times,yet, by 1970 there were 2,394 persons listed within the borough which is located at 39.998007, -79.586127. Unfortunately, I had my own photos connected to a defunct type of camera, but these are hardly possible to access any longer, so I must reluctantly leave my photographic memories of Anchor Glass behind. More's the pity. For this reason alone, if there are few photos accompanying this article as it is published, maybe you can understand why I didn't really bother. 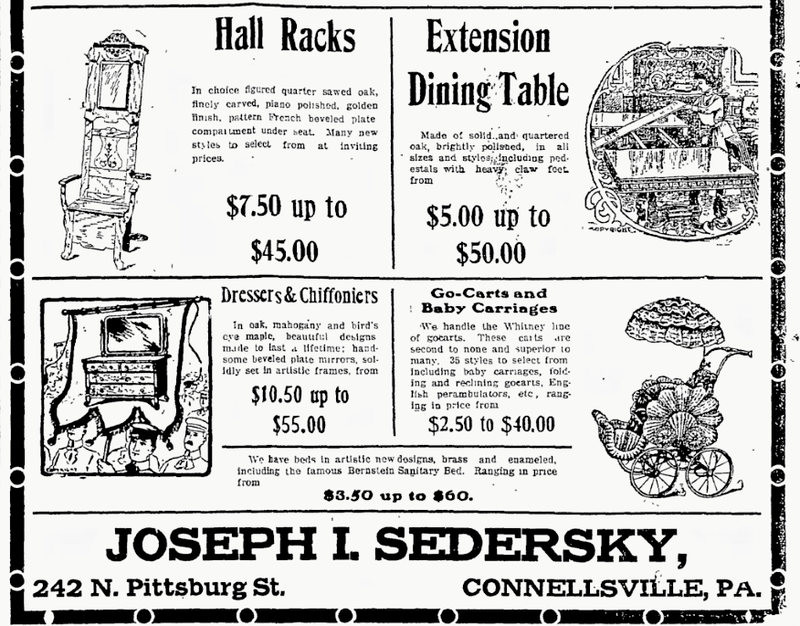 On August 14-17, 1905, Connellsville celebrated it's Centennial. Well folks, in the late 1800's to early 1900's they had a popular military band to play for holidays and important celebrations. 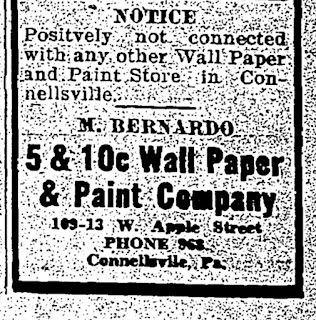 Interestingly enough, the borough of South Connellsville was incorporated in 1911. Once upon a time, these good folks could experience the Newmeyer Opera House. By most accounts, quite a fancy establishment. There was, and still may be, swimming down on South Connellsville beach. I remember the fun had amid the rocky shore in the 70's there. We simply went down on our own. Which reminds me of the stories of the old lake that was at Soisson Park going way back toward the 19th century at Park and Dushane Avenues. The Union School next to the Carnegie Library, which was built in 1901 partly with funds from philanthropist Andrew Carnegie, of course. He provided $50,000 toward construction of the Library and it is one of 3,000 such designed and built between 1885 and 1919. There are so many great houses, banks, stores and impressive buildings with interesting architecture, it would, unfortunately, be beyond the scope of this article to catalog them all. Just to mention a few items 'up north' that were lost in the shuffle - in 1866, Samuel Crossland began the manufacture of fine wagons on the left bank of the Youghiogheny River near Broadford. 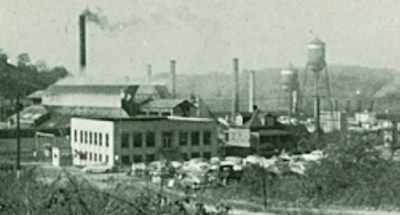 There was the largest lock factory in the world which was established at South Connellsville in 1896 and operated steadily and successfully until the fall of 1898, when it was almost completely destroyed by fire. The Union School further north was next to the Carnegie Library, which was built in 1901 partly with funds from philanthropist Andrew Carnegie, of course. He provided $50,000 toward construction of the Library on an old burial ground and it is one of 3,000 such designed and built between 1885 and 1919. Broadford also had the Morgan Mine and Store there, one among many. Then, there was the Orpheus on N. Pitt., a beautiful theater, so they use to say. 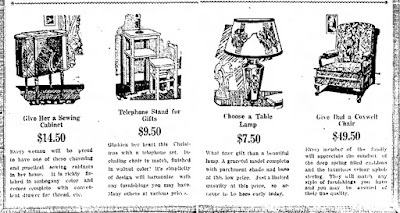 Troutman's, Aaron's and Levin's had the furniture stores...there was the terrible burning of the McCrory's five and ten in the early 1900's, and by Liberty Square was the old PA RxR station and depot. An old suspension bridge spanned Connellsville to New Haven at one time where there were some unusual walking rails and stairs there, while, in catching up, the Connellsville Post Office originated in 1913 on Apple Street. Alright, that takes care of the flashback! In 1866, Samuel Crossland began the manufacture of quality wagons on the left bank of the Youghiogheny River near Broadford. Closer to the subject of this blog post, the Slayer-Barry Company had the largest lock factory in the world which was established at South Connellsville in 1896. This business operated steadily and successfully until the fall of 1898, when it was almost completely destroyed by fire. 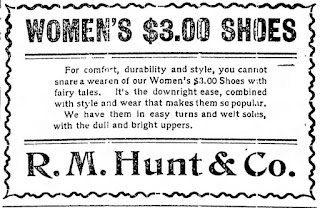 Another important one was Humbert Tin Plate Company. 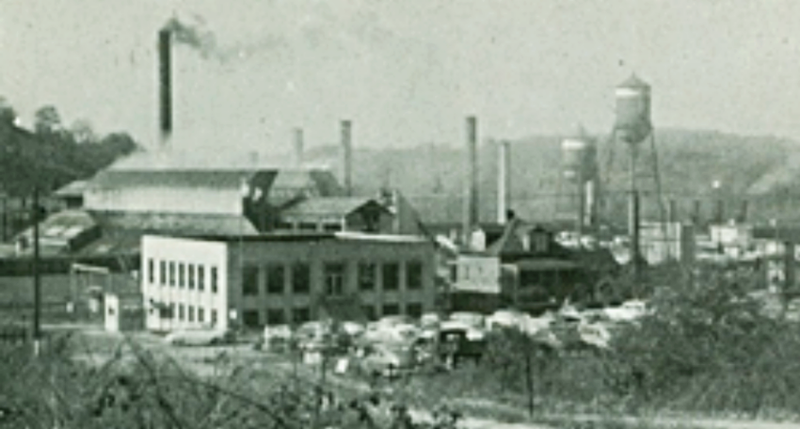 Under the aegis of the Connellsville Extension Company's efforts, (created to expand businesses in the region), between those two factories at the beginning of the Twentieth Century, there was employed almost 600 people. 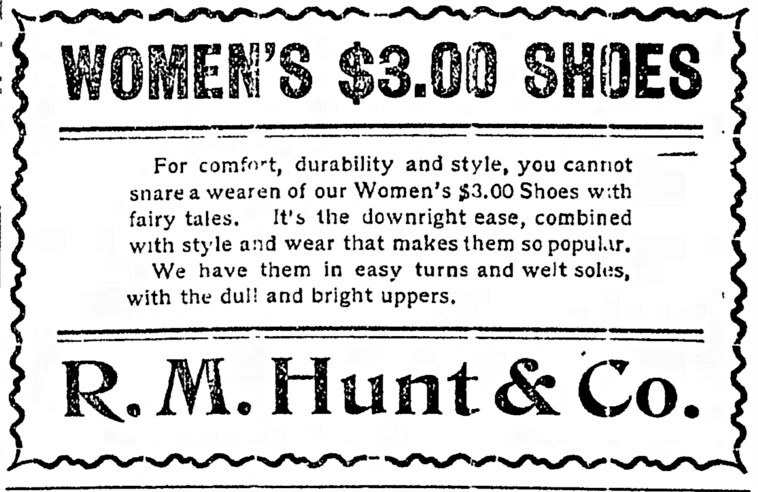 (source-The Connellsville Coke Region: it's Past, Present and Future, 1898). 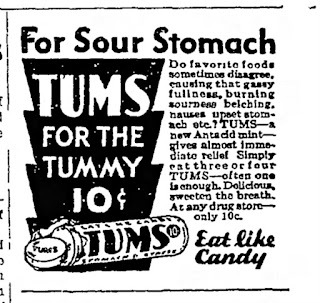 Getting back to our main subject of interest, in the olden days, there existed the huge Colonial Theatre complex, with the Windsor Apartments where the South Side Grocer stands now. Ringer's lumberyard on Pine Street, as well as many may remember the old staples like getting their groceries from Ringer's Store also which, according to the Connellsville Historical Society, was established in 1904. 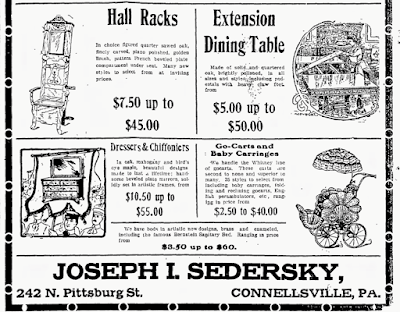 South 'C'ville' was served when people wanted to be moving around and in and out of the borough, by the Connellsville Suburban street car line. 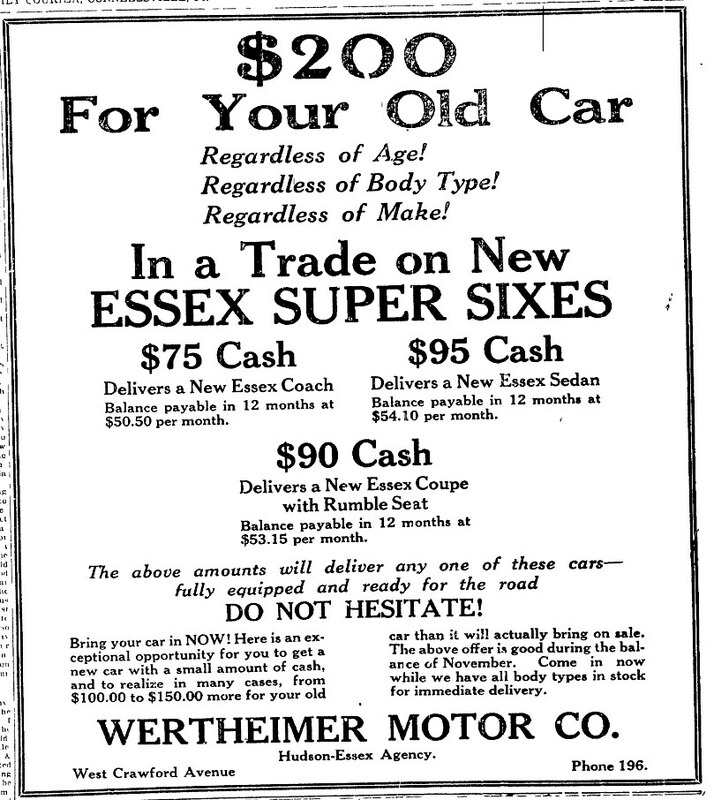 Of course, that was until modern cars took over around the 1950's. Before Anchor Glass was such an imposing employer, locally, Ripley Glass was established since 1866 (believe it, or not! Nah...not THAT Ripley!) over on Pine Street, by Daniel C. Ripley. 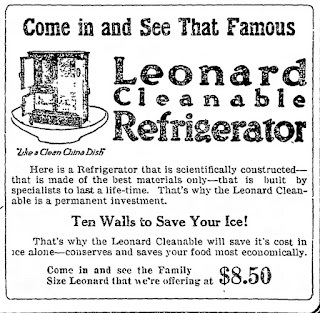 He left the lucrative position with U. S. Glass at Pittsburgh originating from his father and struck out on his own. 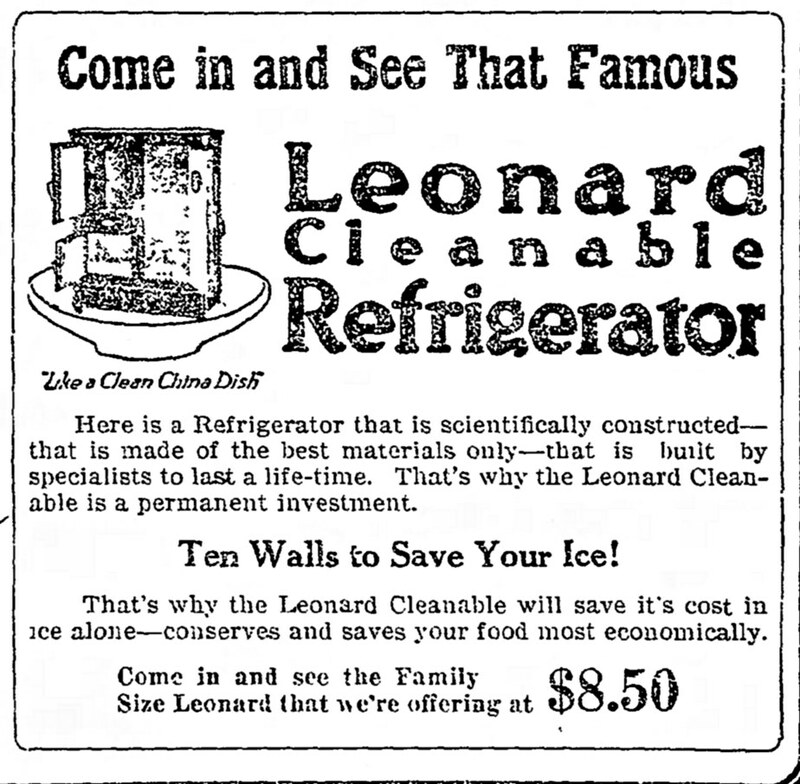 So he formed his own company on the same grounds where Anchor would later be built, and this took place in 1909. Certainly, this factory, bordered on the west by the Youghiogheny River and partly surrounded by dense mountains, has seen it's share of industry of all types. Including, lumber companies, paper mills, movie theaters and pool halls; you name it. The 'Capstan Glass Co.' of South Connellsville has quite a history, and is the one remaining shining star from the past. With hindsight, some of it is sad, and even tragic, which, if you haven't already known of this information, it will be revealed below. The Anchor plant from an old postcard. Beginning operations around 1918, starting out as the Ripley Co. back in 1911, the name changing every so often, there was a peculiar mark or embossed insignia used. 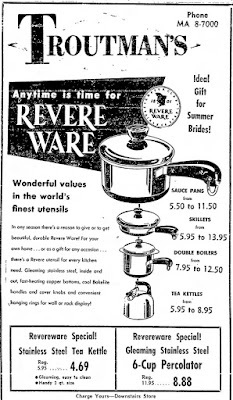 Many of them were baby food jars, though tumblers, tableware, and other somewhat high end stuff was made here over the decades. The items were usually with the anchor, that identifies the era manufactured in. 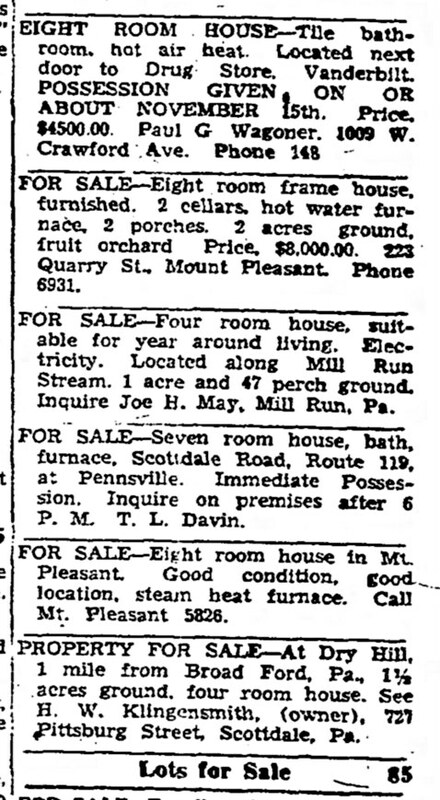 A reopening in 1941 included the twin plant beside it on the Youghiogheny River. 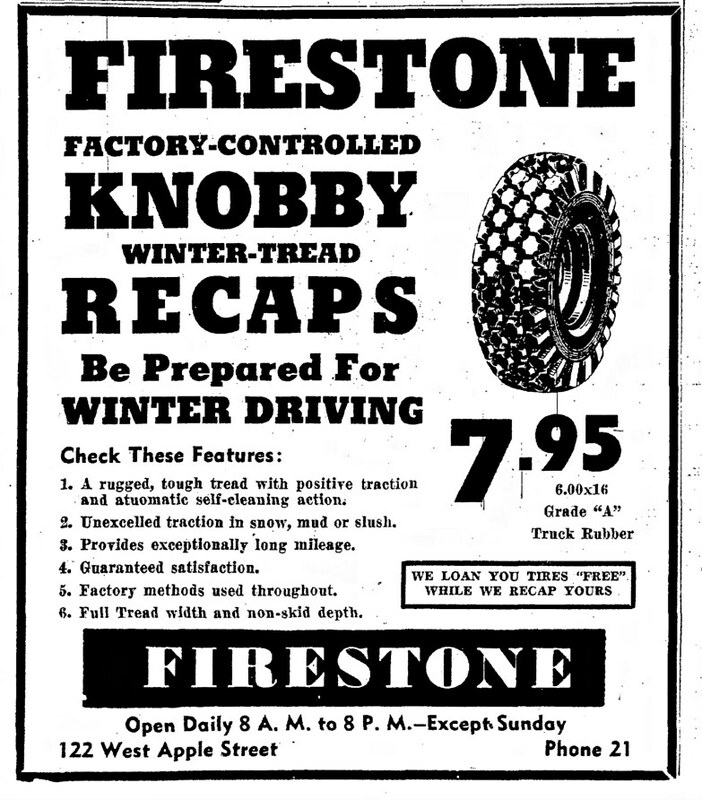 I had a close relative who worked there, (as many of the locals probably did), on the east side at the 'Cap' plant and also retired from there, recently. He could and did, hopefully, with his pension intact! There has been some problems in that area, so we've heard talk of. 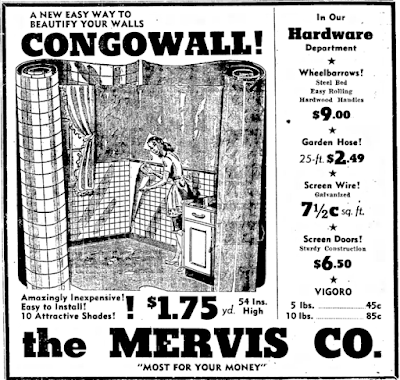 Conveniently, for about four years, I lived in Connelsville, not more than two miles from the plant while working for a time at the Glass factory in a different capacity. I want to relate something of that to help enlighten visitors a bit. Sadly, for the cost of a lot of jobs, the Anchor Glass Container Corporation closed its doors initially, between 2004-2005. It existed in an alternate, more low-key form under another name for some years thereafter. That was when I was employed there. Frankly, there was some hesitation and trepidation when it came to discussing this event that took place in at the glass bottling plant on a spring day in 1985 that so raised eyebrows and shocked the local community. Apparently, according to the sources, (one from the Pittsburgh Press article of Sunday, May 19, 1985, by journalist Douglas Root), the time management 'experts' were a big issue in forcing their brand of improvement, (as happens at every large workplace at some time or other), that can have sometimes an opposite effect on the very morale they are supposed to be addressing, along with the attitude toward the policy of a quickly replaced plant manager that raised questions that will probably go unanswered, yet this complicated an already stressful situation into further perplexity. One Erma Fabian stated, "The transfer was announced as a change that was in the works for some time, but that was a joke. Everyone knew what was going on." There are hardly any excuses conceivable for the kind of shocking behavior that was experienced that day. Hopefully, no one is making any for the disgruntled employee that shot four people to death and wounded one, or maybe two others, but, there is some natural tendency to try to grasp what drives this kind of fatalistic rage, nay near insanity, in the workplace as well as other locations with such a savage mass killing. It is debatable that behavior of this caliber can really be well understood. That sober a conjectural subject is surely not within the scope of this article, thankfully. The armed guards that were immediately installed, were finally removed from roaming the grounds, to the relief of the workers. The following is not an easy paragraph to read, so please skip to the next one if you feel any qualms about it. What I was personally witness to, long after the circumstances took place, near the partly cordoned off break area, not far from the main entrance, was an obvious attempt to remove the worst of the evidence. I could only wonder what was thought of the unsuccessful use of red paint, which, unfortunately, did NOT cover the grisly blood stains that trailed off to where it was all too clear exactly where the supervisors died, and the spot in which I was told, (almost, breathlessly) in which the killer then extinguished his own life. Something I failed to be ignorant of, in spite of initially requesting not to have the story explained. Gossip is an addictive habit and this will, of course, take place regularly in connection to news of this sort. But, in the dingy evening warehouse itself, the silence still reverberating of torrid feelings and echoing in point blank murderous resolution, I would rather not of known all the sordid details that weren't likely to be spared. I can't imagine what those who were in the vicinity and knew these bosses felt, and can only sympathize with their plight. An upset Sonny Hammett, of Dunbar, an assembly line worker, when chastised for taking too much time talking to his wife in an adjacent department, losing his temper even more visibly, was then taken into the office, reprimanded and suspended. You know, I once had a private conversation with the Globe Security man, Jim Silbaugh who felt he would immediately be looked on by Hammett as an armed target. He was partly blamed for the returning entrance of the employee a few hours later. He had told the authorities someone hit him on the head with a weapon and had his own lawsuit to deal with later. His further ideas and testimony will stay discreet, as it should. Regardless of the exact details concerning the situation, a fuming Hammitt came back at 10 a. m. packing a loaded .38 caliber revolver and preceded to use it. All too effectively, killing his shift foreman, Don Abbott. Eventually I was planning a brief editorial discussion on the overall import of these most difficult situations. 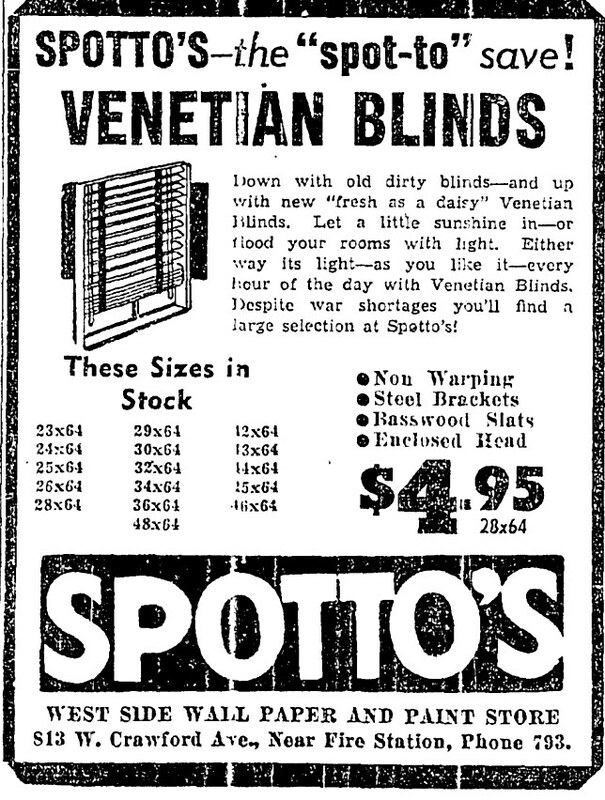 Something of the type could be produced in the future, nevertheless this may well be too touchy a topic for the content of the "Fayette/Westmoreland Forgotten History" blog, especially considering the times we live in. Apparently, that first shooting didn't seem to be enough to spend his revenge. In the swirling confusion engendered, he then furiously attacked and in cold blood, murdered three other managers, and shot and badly wounded another in the process. Then, walking off a distance of 20 yards or so, the horror ended abruptly as he took his own life. A few meaningful words will end this segment; God rest the souls of Paul Gabelt, Donald Abbott, John Coligan and Ralph Tomaro. So, the bottom line is that, sadly, the glass plant laid off a lot of people, like at the old Sony Plant near New Stanton. With mortgages and mouths to feed, itfinally, closed its doors in 2004, though the place lingered on for a few years under various management and does have businesses to this day. Thus a greater depression ensued affecting the rest of South Connellsville particularly hard. There was talk of endeavors for opportunities to lease the plant, but nothing came of this and most of the old buildings were torn down and sold off, a few years ago. Many have vivid memories of heading down the wide walkway of South Pittsburgh Street to their jobs every week day to punch the clock. They still do at the cap plant! Lastly, I wouldn't forget a notice of the fine Veterans Memorial at the intersection of S. Pittsburgh St., Allegheny Avenue and Searson St. A most solemn and dignified addition for the heartfelt recollection of those that fought, and those that died honorably, for this hardy, striving community. You never know, some surprising information may be just 'around the corner'. We can be optimistic and hope for better days, and a change in the way things are done too. Let's celebrate the past heritage while we keep an eye to the future. As I attempted to capture the gathering when visiting the Braddock Crossing and Art on the Yough festival in late June, now years ago, it wasn't that hard to do once I made the attempt. Let's remain positive and get the historical news that is needed. Good to be back for a quick posting, folks! As quite a few of the blog watchers of Fayette/Westmoreland Forgotten History tend to live in the northeastern portion of the United States (nothing against the rest of you -glad you are joining us! ), you may well of experienced a spring snowstorm recently. We are all the more looking forward to milder and more seasonable weather, and, Very Soon! I've had a couple problems with the blog lately. Well, more precisely, my aging home computer has been 'acting up' for months and having a time finding a solution besides replacing it altogether. A thorny little ongoing situation I hesitate in mentioning. Although we won't be going into all the needling details right here, I am in the very early process of writing a book. While this idea is finally about to come off the dusty shelf, here's hoping many visitors and followers will be excited to eventually find fresh regional historical material brought together in a qualitative physical state in the not too distant future. I certainly would like that to be the case! Maybe we can discover a way to achieve this accomplishment together! Now, I have been experiencing a large sum of 'changes' on differing levels, mostly within the last year and a half. I find less opportunity for drawn out online searching and field work that desperately needs done. Yes, on-the-ground, honest to goodness, RESEARCH. That stuff too! There are places I want to - need to, get closer to checking out more thoroughly. Frankly, it hasn't been happening. So, to get to the major point among mounting difficulties, I may be in the market of 'hiring' for a position. You'll see what I'm getting at in a moment. 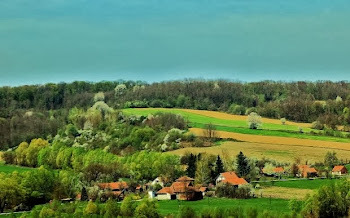 Also at issue, there are far Too MANY draft posts partly written which are being neglected for one reason or other, regardless of the legitimacy those excuses hold on the surface.Understand, there has been a steadfast rule for years concerning the sole responsibility in coordinating the various projects undertaken on F/WFH. I suppose there comes a time to face up to newer realities, in fact, the blog could be losing a degree of its edge by continually holding to this point. Therefore, it behooves me seriously enough to think, perhaps reluctantly, of taking on a well meaning, hopefully thoughtful individual with a touch of computer savvy and a certain deal of know how. You know, a videographer who conveniently lives close by would be a real boon, to say the least! If these high attributes may be somewhat lacking, maybe a goodly percentage of instinct would do the trick in a pinch. With the lesser amount in chunks of time in my situation, yet with feedback telling me please continue updating, what may be required the most is - sort of, a secretary. Or, to put a more fitting title to the job, I am almost at the threshold of needing a real, live co-admin. While I would, of course, maintain basic control. Alright, since we are talking about Blogger, and I'm not even positive what all the details imply, the contribution of an Editor or as an Author, would be of fine service. Next point of order, who out there among you fine people would be willing to help in filling this presumable role ? Do realize, under the circumstances, we would have to have a charitable arrangement. BUT, there might be the satisfaction of some influence. Meaning: suggestions will be strongly considered, as well original ideas and wording would be looked into carefully; just maybe, as an Author obviously implies, an occasional blog would be permitted. How's that sound? With my grip so long firmly on the site's wheel, this would be by no means an easy offer, or a call of help that is being taken lightly. IF, and that's a big if, no one is forthcoming on the matter at hand, maybe a part-time kind of cooperation could be managed. We can check out the pros and cons later. Well, all those promising candidates, please take a few minutes to send me in a private email any qualifications or credentials, which are a real plus, briefly explain in a few words your love of regional history or your slant on the blog with its implications, and decide in what aspect you feel you would be most useful. Thank you very much! If, indeed, there is little meaningful response, (perish the thought! ), I will continue to try to do the usual; simply, remain a good trooper and find an alternate method of ironing things out! First off, I want to make a quick statement: don't let the apparent critical side of this post cause anyone undue worry or sadness, OK? I don't mean to put too negative a connotation on the matter at hand. It's all in the perspective which may include a subjective interpretation. In my usual overblown fashion I am here pointing out a sometimes frustrating aspect of writing a blog for well over four years. Some things one can take for granted and should; some things one can do so only at your own peril and the chance of being ignored and relegated in a way that can be quite mystifying; this can be a persistent risk. There is a lighthearted side to things too and I can get a bit over-dramatic at the best of times. A touch of concern and a smidgen of thought is really all I can or should expect by this outreach. The story of these occasional factors inherent in doing a website, or in my case, a blog, is expressed below. One big reason visitors are even reading the post concerns the fact that my 'new' computer is almost as old as the F/WFH blog! Now, it's weird, but within the last month the ol' Acer has been having technical issues with the search boxes, messages and mysteriously jumping to the address bar. A study in frustration in which I've searched around for a solution, but nobody has much understanding of this one, unfortunately. Some forums tend to think this is an after effect from upgrading to Windows 10, while the other conjectures are less certain and involve downloading new drivers and whatnot. A workaround requires me to type into a word document and copy and paste. My technical skill is not necessarily a help to the situation, either. So, you see, of course, one could 'simply' reinstall Windows and all, but that is a last resort comparable to breaking down and purchasing a new computer. Probably, in the first place, many of you will smartly gather that the reason behind the glitch might be that I am working on an older model computer, and you are likely spot on in arriving with such a judgement. For the time being, I am forced to wait and see if Windows will include an update to fix the problem. I've tried many things and they didn't work, but I'm hardheaded enough I haven't given up. Any good ideas for a real solution, do please drop me a line! c.-A surprising discovery on a person related to a famous figure who owned land here. d.- None of the above; something even more exciting! Alright, getting back to the main point at hand, keep in mind, I am not discussing popularity. On the contrary, we are doing dandy in that department, and I have you good folks to kindly thank for that! This is a few observations toward a rather minor given moment in time. Now that the warning is given, please read on. Frankly, that whatever support base existed in headier days past, exactly why the blog felt their unique notice and held it for some time, has basically vanished away faster than an old building near a mill refurbished as a town house, upstream from a few once infamous coke ovens, now overgrown with weeds and brush. Not quite to that extent, but the exaggeration does give the picture better focus! Yes, I noticed over many months, the singular fact that some of my more expressive and meaningful perceptions come willy nilly from out of practically nowhere at all. Bang them out and publish them, I suppose, come ill or high water, or negative reactions. This may have a dash of uncomfortable backlash as you will read below. On the surface, I do hesitate to make public my personal feelings for the usual reasons. See what you think, because your opinions and outlook are all that really matter. Also, it is to be freely admitted, these type of posts Do Not get a whole lot of Page Views, as can likely be guessed. Now, another case in point: although I'm not going to bother linking to these, I have done a couple particular posts sincerely celebrating and showing appreciation for those persons in any real factoring in that influenced the blog, even minutely; whether the connection came about by collaboration, admiration (sometimes mutual), a place or subject we had a common interest in, a shared tidbit, bit of advice or something of that ilk. Most of those that people, bless their hearts, were so enthusiastic in responding in a positive sense, either by email, comment section, or what have you, are almost purposefully, gone. The small conundrum curiously includes those that by all appearances the blog itself had a definitely positive effect upon. Regardless, the result is now the same - puzzlement and consternation on my part. Over reaction? Oh, almost certainly so. I've then become a bit of touchy old fool. These particularly knowledgeable and perceptive men and women were at one time or another very connected up with aspects of the blog. Naturally, I prided myself in their gracious company. Not that they were expected to always BE THERE. Usually, I just accept that with an oh, so philosophical turn of mind. Shrug it off, like a dog does a flea. It's not that most truly had very much to do with the final and wholesale decisions; in fact, far from it, but there is no doubt I did appreciate their varied input. They still became an integral facet toward flow and feedback from one post to another and I would hardly of considered the possibility their interest would slowly wane. Yet, it is very true, the actual brunt of responsibility for an account for a decent article was on my shoulders alone. That is squarely where it belonged, in my opinion. At least I can take credit in that department. The funny thing is, I didn't really expect the initial interest that showed. Later, I realized I could of done more to elicit a broader influx of attention from various departments and individuals. Probably the only avenue of choice to my style of accomplishing anything worthwhile is to keep a clear focus of the original vision and intent as set out from the beginning. Such an outlook, I felt, would guide me well. That may be a clue to the problem, I don't know. While the blog still receives its share of off and on emails, and this is continually encouraging, I may be a bit late in responding now and again, although mostly in a polite and fairly considerate manner, Yet, the subject can be a head scratch-er for sure. It might not seem such a big deal, but I feel there wasn't any actual "turn off switch" on my part that somehow disallowed their expression from yours truly that I am remotely aware of. Strangely enough, I am left with an abiding impression that in some odd fashion this might be for the better. Go figure that one. I only a hunch or two to be more detailed in the description of why this appears true beyond going about the job of picking and choosing material to highlight as I see fit. The occasional emotions evinced that coincide with this slow discovery of outside influences or the lack thereof, borders on the gamut of: disheartening, stressful, perplexed, suspicion, bruised ego, guilt, disgust, insult, lack of concern, and a touch of sadness. A depressing bunch if ever there was, wouldn't you folks surely agree?! But a quite natural progression just the same.There are probably a few others which will come to mind if I think about the idea way too deeply. Oh, yes, there is the substantial feeling of sheer abandonment which I have been struck with on occasion. So, there you go. The reasons behind this extraordinary occurrence has been noted by a few admin bloggers and webmasters over the years. Before my involvement, this wasn't taken too seriously on a personal level, of course, yet many of these experiences bloggers have noted which I read with some small indifference have been replaced under later circumstances by others with people even more fervently interested than those early, sometimes lukewarm followers which they were left without. Therefore, the lack was barely noticeable. Funny thing, in my own circumstances with the subject I mainly write about, many of those people tend to be even more fickle with their patronage than the earlier guys and gals. I've teased my cynical, convoluted and overheated brain hard to try to figure this one out, but do not and have not come up with any sensible conclusions or satisfying answers whatsoever. Chalk it all up to it being sort of, just 'one of those things'. Otherwise, there isn't much left for a rational explanation except human nature, or something. If I, myself, was the direct cause, surely these folks would of hinted in some way that I offended them somehow or didn't cater to their whims as inordinately as they so wished. This rare occurrence was, in fact, primarily about principles. OK, so I'm old fashioned. The situation concerned a really integral and influential lady that knew I was considering a sort of investigative expose of someone 'high up'. Also, a unique person themselves who had originally encouraged me strongly and then...to put it delicately, not very much, on important issues within the space of a few months. "Why bother? ", the lady bluntly stated. That stumped me in my tracks as I felt this had already been thoroughly explained. Without going into an extremely detailed report, I reluctantly had responded to the effect that, well, my ancestry and services were in some ways harshly impinged and in my view it appeared to clearly be a matter of questioning my journalistic qualifications and to a degree, my integrity, in the process. Excuse me, but that was a touchy, even prickly factor to be stuck in through no actual fault of mine. It was obvious this seriously irked me, not just the usual amount which can often be ignored. Yes, indeed, at the time I was sorely tempted to go the route of what is termed yellow journalism. This apparently cooled the correspondent's heels toward me, a real shame. Readers need to know, I had to think this through pretty darn deeply before going the high road, when the facts and figures on the low road, so to speak, would easily speak volumes to anyone intimately associated with them, justifying my position. Still, a very successful post would of been the immediate result. It can be assumed I was all too openly and mistakenly offering my opinions to someone considered worthy of inside knowledge, who, I wouldn't of guessed, also had, as coincidence would have it, indirect access through contacts with the person rather 'high up'. Time to learn a lesson, I guess, and, oh I did! Whether the idea had any influence, I am not aware of any such proof, but in the long run, publishing the story might of made enemies, and I obviously wasn't careful enough with being discrete and suffered for it sometimes. In a way, my bad. I even referred to the story in an email with a successful author and collaborator; he also advised me against making waves. With this example, in spite of the lack of contact on her part, (I tried to keep in touch with the lady numerous times and finally just the yearly, "Merry Christmas" to no effect, except once when in a few words she said that she was moving on from the subject which seemed a tad unlikely, but may basically be the truth), to this day, I still appreciated her friendship while it lasted, highly respect her knowledge and class, remaining on good terms with the 'high up' party, and think the world of the lady. The lady that stopped having communications with me. Yep. Maybe that helps to give a perspective into the kind of stuff I am relating to here. That is not really the way it is though. Most of the loss of contacts, except in an email folder or a cell phone, were much more inexplicable and unexplained. No one was offended, nothing untoward occurred. Surprisingly, the underlying reality may not matter all that much. A successful blog exists and must be doing something right. And to be fair...not all contacts were completely lost. Some are just too busy, drifted apart and were only concerned with a few posts and will respond at times when we have reason to get in touch. A quick shout out to all you folks! One big silver lining on the foreground of this somewhat bleak windswept dark and clouded landscape, is the clear and continuous climb of page views and active popularity of the historical ramifications gathered up and presented here. It could be supposed that the matter should be left to the dustbin and ignored as an oddity not worth further mention. In a way, I wish I were that dishonest with myself. SOoo...I only relate one of these side issues because I care about what others think of the blog and its inner workings. In another aspect of this causeless neglect, more importantly perhaps, there has often been a barely minuscule response from proper organizations and reputable institutions across the board, even at this point of extended longevity. Jealousy, you say? H'mmm... possibly, although there has been some amount of contact. Did 'they' really notice 'Fayette/Westmoreland Forgotten History' that much? I wouldn't dare make the assumption, yet it is hardly invisible. It comes up fairly well on search engines, anyway. Just a concerted lack of attention. I can't say there has been a slew of concerted attempts to bring added attention on my part. Still that could be a detrimental fault of my own and doesn't completely explain the lack of proper treatment it receives. Certainly, no one could call me out for harassment, and that includes the newspapers, too. After all, it is fairly obvious the credentials are not there. I am not a guy with a Ph. D in history, a teaching tenure, or an historical society president. Not exactly on that premium level, I'm afraid. An outsider in many ways. Neither one that kisses up deeply or frequently with those that could affect or rarely offer a mumble of encouragement. It just isn't done that way here. So be it, friends. Frankly, I am getting tired of apologizing in halting, subdued terms for my lack of perceivable and self important influence with the movers and shakers of the archeological world and those sometimes high minded personages of historic preservation that still neglect many out of the way key interests that are 'on the map'. After all, these are documented items, some only given the attention deserved on these pages of fairly solid historical content on the list of meaningful connections in our state and this country. And there are serious repercussions to neglecting the history of this region and others - they are being plowed under and subject to destruction, simply put. We should all find this truly and totally unacceptable. Many of those that have resources to take up the cudgel and fight for OUR past and its due recognition blissfully ignore much else but their own pet projects to the detriment of all those that are not on the door step of, say, Philadelphia or Harrisburg, the heavily populated environs, year after year, after year. If the approaching and encroaching on their favorite and coddled turf makes me seem to them disreputable and without merit, someone to be gently nudged out of view, I guess that is just a breath of fresh air in disguise. On the other hand...ha ha, you know I made more friends right there! Stuck my foot in it again. I am partly joking though, this well may NOT be properly describing a complicated situation. Don't take those comments too urgently. Some of these 'higher ups' do care, there's just not enough that do anything about it when prompted! While I am in a critical vein, maybe, just maybe, this mood induces me to proclaim the facts as needed. The 'powers that be' should soon open their eyes wide enough and wipe the dollar signs of tourism and cobwebs of highly linked and higher placed vacuous self serving authority away which denudes their path strewn with misinformed assumptions and discover that here in a smaller, less innocuous venue is contained raw, honest to goodness concerns with a good smattering of research that is of a form of quality worthy of the masses. They own their niche. Many, but not all, brush those like my humbler blog work aside from their conscience as dandruff from a lapel, while a few revel in doing so and could not ponder any other way of looking at things. Thus the lack of time and money are the key components fueling their paranoid nature, to desperately survive at all costs. I am also not guiltless when it comes to just not doing enough; there is always more time and effort I should squeeze out of my life to deal with the issues at hand. This is also a situation that concerns the express purposes of all our historical societies and their foundational interests, not always apparent in their fundraising endeavors. Their support of these causes are paramount to success for further activity in the long run. The spirit is willing but the flesh is weak. On the bright, sunny side, at least, I am not so caught up in answering long emails, constant comments and phone inquiries about someone's ancestors, best hotels with a sauna, areas I've barely heard of, picking and choosing words very carefully and how fascinating they are in their own significantly fine minds. Consistently being drawn away from the basic intent of a history blog on minor, tedious back roads. There is that to be thankful for. Oh, but what forgotten wonders these back roads lead to! Well, whatever is behind the stony and blank facade, that's something I'm use to experiencing by now. I might not understand the implications very well, but will get over it in the end. The creative and investigative side of writing these posts are very much enjoyed and I have had plenty of fun coming up with different ideas, though lax in presenting them frequently. I do sincerely hope to continue to intrigue and at the same time help to educate discerning visitors; indicative perhaps of deserving of a certain response and captivating people enough to justify considering and expecting the odd email, occasional comment, and return from Neverland of a few colleagues, collaborators and once closely involved, sympathetic parties. I do absolutely appreciate hearing from all of you, just the same. 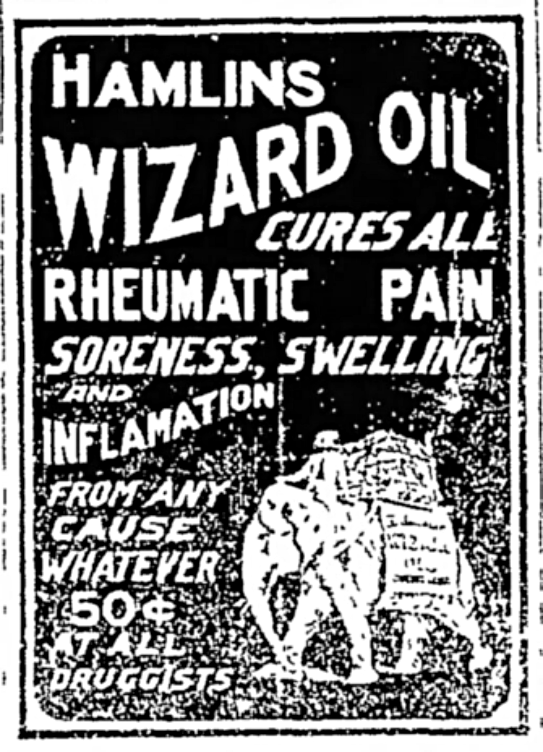 Thanks for reading of the oddity of this rather absurd predicament. You all matter extremely and I value your patronage and interest very much, otherwise I wouldn't make the effort in the first place. The brass tacks of what it all boils down to is a simple request for your support through a basic interest in our history. If visitors, old colleagues, new sponsors, those that just have a passing acquaintance yet feel deep down they are much intrigued and one time collaborators, ALL, if YOU have indeed enjoyed and gained some satisfaction through F/WFH then, by all means, come back to the fold, take time to keep involved, give me some needed feedback and show a degree of support! Though this blog makes every attempt to be accurate as to dates, names and places, please do not hold the author responsible if there are occasional errors. If any mistake or infringement takes place accidentally, send e-mail or peruse the comment section for a complaint thereto and it will be investigated thoroughly and corrected as promptly as possible. Images and text copying not permitted, copyright histbuffer, unless otherwise noted. Simple theme. Theme images by Nikada. Powered by Blogger.